This coulis is made from the last pick of the autumn blackberries for this season and my Dad grew them. There was such a lot of fruit that Mum and I decided to make a coulis so we could store it in the pantry and savour that blackberry taste for months ahead. 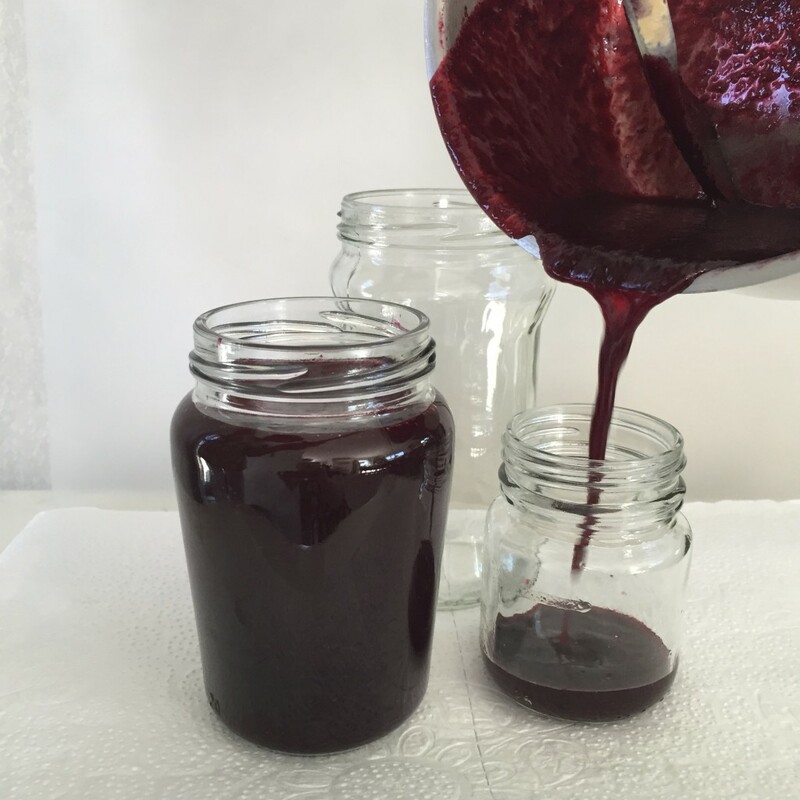 This recipe is for a thick fruit pulp that is made like a jam, but remains fluid like a sauce. It is double boiled so it will keep well in sterilized jars. Place blackberries, apple, and water in a saucepan and bring to the boil. Simmer for about 15 minutes until fruit is pulpy. Leave until cool enough to puree in a blender (alternatively push the pulp through a sieve without pureeing, but you will get more pulp if it is pureed first). Strain the pureed fruit pulp through a sieve, and push the pulp through. Place the strained pulp back into the saucepan and add sugar and lemon juice. Bring to the boil, for about 8 minutes, to reduce the water content. Test the consistency on a plate – look for a consistency that is pourable, not like a thick jam. Wash and dry glass jars. Place them in the oven at 170 degrees Celsius for 10 minutes. If the lids are metal, boil them in a pot of water for 10 minutes, or cover jars with cellophane or jam covers. Pour hot coulis into hot sterilized jars (let the jars cool slightly after being in the oven so the jam doesn’t sizzle on the hot glass).